I have finally come back to earth after last week and have rested and taken some time out. 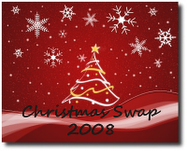 The show was great for us and we were really pleased with how it all went. It is a lot of work putting together a stand at one of these larger shows but it is well worth the extra effort. It all came together just as we had planned and the new range with all the fruit and veg fitted perfectly... We also received lots of lovely comments on the overall look of the stand too. Apart from the very muddy, rainy start to the week and a drip on our stall (at least we were inside! ), the remainder of the week was lovely and sunny. We also got a chance to look around and I thought i would share with you some of the gardens that caught my eye. 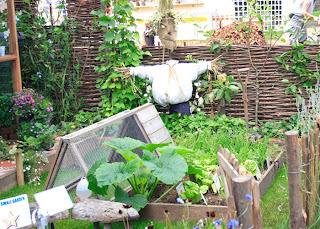 This is the small garden fom Alton Infants School , which is in the town where our studio is. 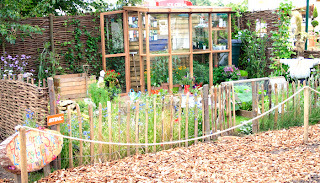 The garden represents a microcosm of the school grounds and has been designed for education and fun. As the Chinese proverb says, 'I hear and I forget; I see and I remember; I do and I understand'. The garden teaches the children conservation, recycling, organic gardening, plant and animal life cycles and caring for the world. 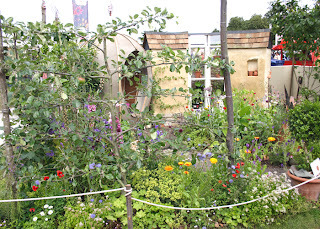 They won best small garden and a gold medal. They did have a chicken too but apparently only there for 'press day'. Another beautiful small garden was 'Selborniensis', I was drawn to this garden not realising it was created by two women from our locality. It is inspired by the work of naturalist Gilbert White. I love the use of the apple as a screen, the relaxed naturalistic planting and the clay sculptures. designed by the lovely Chris Beardshaw. It illustrates how teaching and learning can take place outside the classroom and has been created with participation from children of all ages from more than 30 schools. This spider and web is fantastic and i expect we will be seeing them pop up in schools throught the uk! The Daily Mail had a large feature garden 'The Darling Buds of May', and as you can imagine it was full of nostalgia and extremely popular. They even had a Pig with her piglets who liked to sleep in a row in the sun. Very cute! 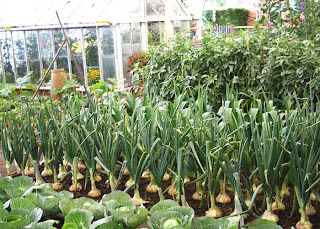 And my favourite view was of the lovely lovely veg! 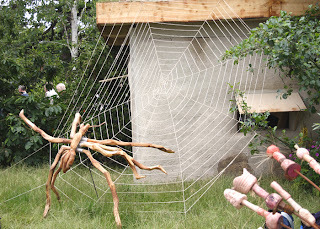 After all the rain we've had my garden is in need of lots of attention.. and now i have a few new ideas...i wonder if the kids would like to make a giant spider? It sounds like a great event and I am so happy that it went well for you. 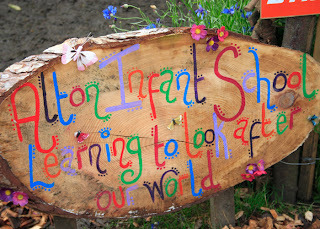 The Alton Infants School garden is very impressive. Isn't it wonderful when children have an opportunity to see how things grow? I Will keep popping in to have a peek at your blog from now on. So pleased you had a good time and were a success after all that hard work! Your stall looked wonderful from the photos. Thanks for sharing pics of gardens with us. Hope you have a great and relaxing weekend. Great that things went well for you but I'm really not surprised your goods fitted so well with a garden shown (I'm pretty sure that that was by design not accident) Thanks for sharing some of the lovely gardens with those of us who were unable to attend. And I'm really pleased it was a success for you. OH wow! 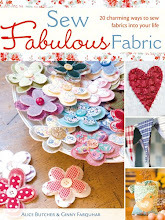 Loved this...will be having a look on your web page.....I just know I will have to buy something, but what? everything is so gorgeous! Hmmmmmmmmmmmmmmmmmmm totters off for a think! Hi Ginny! Thanks for stopping by my blog and leaving such nice comments:) Your blog is lovely! - I shall return for a more in depth look later! Good to hear your hard work paid off! Not too sure about the spider!!! Not my favourite hairy thing! Just found your blog tonight - lovely. The show looks it was lovely. Did I read about you in a recent magazine - your pics and information looked and sounded familiar. Love your work. Thank you for you sweet comments on my blog. I will popping in to yours now that I have found it. 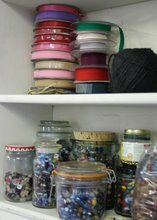 Your comments were spot on but I cannot relax if the house looks too messy. 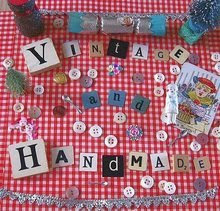 I think it's great for children to make homemade items especially cards as it is so much nicer and thoughtful. You are right I do have a lovely supportive partner - he shows lots of interest and encouragement but he knows I lack confidence in myself. Glad the show went well. Hello Ginny - thank you for your kind comments - I would be very flattered indeed to be included! 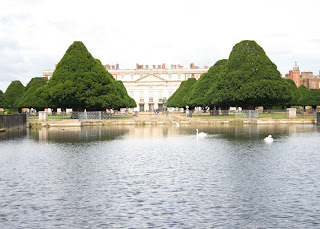 And now I must dash - because I want to read all about the Hampton Court Show on your blog. It is not a million miles from me but I didn't go this year.